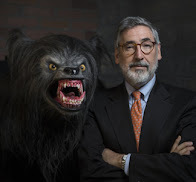 JA: You have been nominated for multiple awards, including 2 Emmys, for your achievements in animation. Let's start with your work in the 80s; how did you become involved in Thundercats, and what was your experience like trying to grow as an artist during this period of animation? BC: I was living in a Tribecca loft with a bunch of other comic artists. Jim Meskimen, a comedian, actor and cartoonist moved in with us. He had been working at Rankin Bass doing character designs for Thundercats. He was moving on I guess to focus on his improv and acting work and reccomended me for the job. I did design work on several series for Rankin during this period all in different styles. Everything from props to characters and BGs. During this period I picked up any kind of cartoon work I could so I was able to develop many different styles. At this same time I was doing comic book work for Marvel comic strips, National Lampoon, and movie parodies for Crazy magazine. 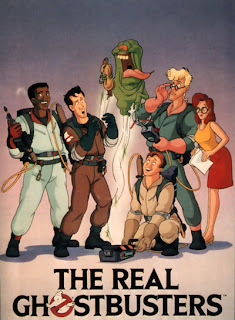 JA: After your work as a character designer for Silver Hawks and The Comic Strip, you worked in the animation department for DiC on The Real Ghostbusters; what pressures were involved in working on a series based on such a popular movie franchise, and what were your feelings about the animation DiC was producing? BC: That show was a breeze for me. Before that I was acting as an entire design crew for multiple shows. This was just one show and I sat next to Bruce Timm having a blast drawing monsters and ghosts all day. I learned a lot just watching Bruce draw. I called him the human sewing machine because of the speed at which he drew. I was ok with the animation DiC produced. It was a job and I lived across the street and got to hang out with funny artists all day. At the time it was an ideal situation for me and many of the people there during that period are big shots in the industry now. JA: After The Real Ghostbusters you became involved in another DiC production, Beany and Cecil, as a storyboard artist; how did you become involved with the series, and was this where you met director John Kricfalusi? BC: Yeah, the first person I met at DiC was Jim Gomez and he introduced me to John and Lynne Naylor. JA: Voice actor Billy West, who would later voice Stimpy in The Ren & Stimpy Show, was also involved in Beany and Cecil; what kind of feedback did you recieve recreating the Bob Clampett series, and at what point did the idea come about to break away and do something original together? BC: I didn't know Billy at that point as I wasn't invited to the recording sessions. I thought his voices were great though. I got very little feedback on my work there. John was staying in his office most of the time. I did get lots of inspiration from Eddie Fitzgerald at that point. He was directing on the show. The layout crews were mostly people from Ralph Bakshi's Mighty Mouse. They had learned the fine art of doing whatever the hell they wanted from Mighty Mouse. It was a cartoon free for all. After John fired Eddie, his crew continued to layout cartoons without any supervision. I remember we showed a cartoon to the lady from the network. The last scene was Cecil singing his song in the water while Beany floated up in a wash tub. Cecil snorted Beany up inside his nose and shot his clothes back out of his nostril. The woman screamed and John and I took off running and hid somewhere like kids that'd broken a window with a baseball. One day someone went around and told everyone to leave. No notice. I went out and got hammered with some people. Everyone else stole everything that wasn't nailed down. 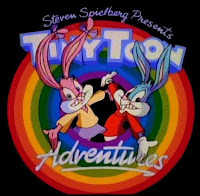 JA: You also worked as a storyboard artist on Tiny Toon Adventures; did you work with Eddie Fitzgerald on the series? BC: Yeah I worked with Eddie. 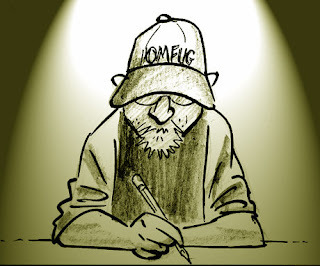 I learned a lot about drawing funny from him. The crew on that show was amazing. Lots of heavy hitters. I shared a cubicle with Chris Reccardi. Lots of prankster mayhem going on. The show was frustrating for a lot of us though. We were told it'd be like Termite Terrace and the cartoonists would have control to make real cartoons like Bob Clampett and Chuck Jones. Such was not the case. JA: Tell me about your involvment getting Spumco and The Ren & Stimpy Show off the ground; what role did Vanessa Coffey play in helping getting the show on the air? BC: John and I shared an office in Hollywood with Jerry Beck before there was a Spumco. We were picking up any freelance we could. We didn't even have any furniture back then. Jerry was partnered up with Carl Macek in Streamline pictures and they were distributing Japanese animation. I'm fuzzy on the details but Carl and John went to Nick and met with Vanessa. John pitched ideas he had created with friends in college in Canada. One was called Your Gang, kind of a parody of Our Gang. 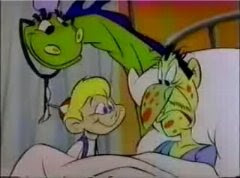 Ren Hoek and Stimpy were just a couple of characters in the pitch. They said that they wanted just the dog and cat and they made a deal to make a pilot. Vanessa had everything to do with getting the show on the air. She doesn't get enough credit for that. 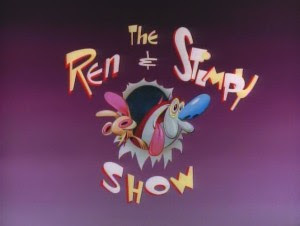 JA: You worked in just about every area of production for The Ren & Stimpy Show: from writing, directing, storyboards, BGs, character design, voice actor, and much more; tell me about your life during the peak of the show's popularity at Nickelodeon. BC: It was the best of times, it was the worst of times. 'Nuff said. JA: When Nickelodeon fired Spumco from Ren and Stimpy production, you took over the responsibilities of the show under the newly developed Games Animation; what was this time like for you with the loss of John Kricfalusi, in what ways were you pressured to change from the way Spumco did things, and what feedback were you recieving from Nickelodeon once the ball was rolling? BC: At first it was terrible. It was frankly a very tough decision for me to make. As you know there were lots of hard feelings about all of that. Things improved as we got into production, actually producing cartoons and meeting deadlines. We weren't really pressured to change anything. There was always the constant changes from Broadcast Standards and Practices but that is always part of the process and had nothing to do with John or Spumco. There was always tension in and around R&S. We were mostly rebelious funny a-holes and the studio never really understood what the show was about or why it was so popular. I think they were happy when it was over. 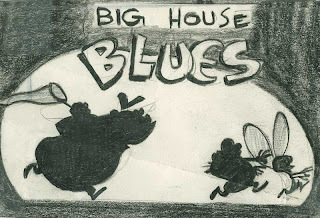 JA: After Ren & Stimpy ran 5 seasons, you went on to work in features; tell me about your time spent working as a storyboard artist for Looney Tunes: Back In Action, and the work you did for the abandoned sequel to Space Jam. BC: Yeah. I like doing feature work. 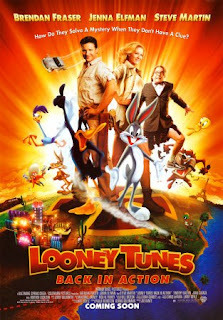 Looney Tunes: Back in Action was OK. I got to work with the great director Joe Dante. 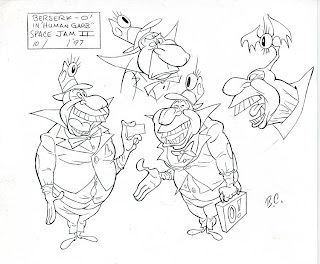 I wasn't too fond of the script but I got work with some fine artists including the famous animator Eric Goldberg. We did that on the Warners lot which is always fun being in the middle of a big hollywood machine like that. We tried to get Space Jam 2 off the ground but Michael Jordan didn't want any part of it. JA: You also worked as a storyboard artist for Blue Sky on both Robots and Ice Age: The Meltdown; what was your experience like at this studio, and also, what are your thoughts on today's feature animation being produced? BC: It's always great to work on a big feature like that. Being surrounded by hundreds of talented artists is just fantastic. Of course being part of a huge production can be frustrating at times but I just remind myself that I'm lucky to be able to do what I love. It's still a lot of fun. I think the animated features being produced now are way better than they have been. Lots of great new directors and stories. People have gotten out of the idea of trying to make counterfit Disney movies. I wish that there were still traditionally animated features being made in the US. The idea that CG films are the only ones that people will watch is so much crap. It's all about story and character. BC: Tex Avery's Deputy Droopy. Hands down. JA: So what can we expect to see next from Bob Camp? BC: More film storyboards. I'm creating lots of new properties that I'm pitching around. Check out my blog. I'm putting up old drawings, new ones and the occasional theory.